For the pocket pistols, this 001 pocket holster can be used left or right handed. The design provides for stability to maintain the proper drawing position and retention. Can be used in the trouser pocket or coat pocket. Only available in Saddle Brown. 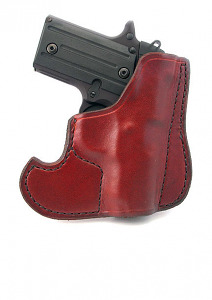 This holster is designed specifically for the Sig Sauer P238 .380 pocket pistols. Hex Head Bit - 1/8"